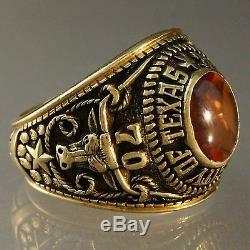 CHECK OUT OUR OTHER VINTAGE WATCH, JEWELRY, STERLING & ESTATE AUCTIONS! 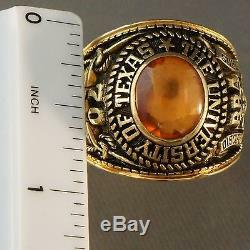 Massive, Vintage, 1970 solid 10K yellow gold, and synthetic citrine, University of Texas, men's class ring, in excellent original condition. 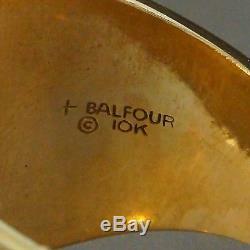 High quality, vintage piece, handcrafted by Balfour. 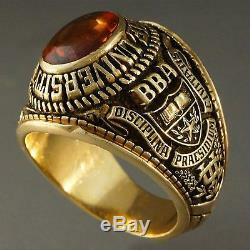 This is a huge, heavy, solid 10K yellow gold, Bachelor of Business Administration ring, with fine milgrain work. The brightly polished gold relief, set against a darkened, recessed, antiqued background, creates a bold contrast. 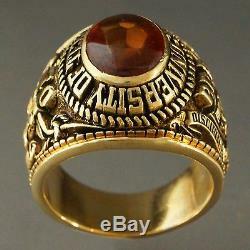 The bezel-set, smooth surface, flame orange, synthetic citrine, integrates wonderfully into this piece. 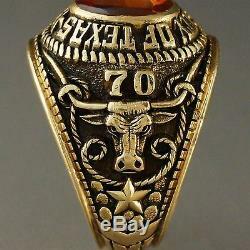 The right shoulder features a fierce looking longhorn. Size 11 3/4, could be sized to fit similar. 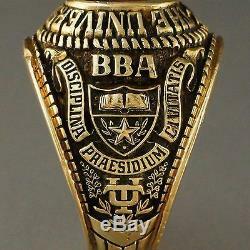 Engraved initials could be removed from the inside of the band if so desired. Minor chips in the synthetic citrine, commensurate with age. Please review our detailed photos. Measures over 7/8 (23.2mm) wide, tapering to a 7.8mm shank. Weighs 37.7 grams over 1 Troy ounce! Please do not save questions until the last minute as they may not be able to be answered in time. We usually respond to emails within 24 hours. 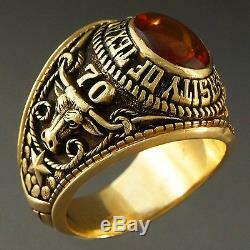 We unconditionally guarantee the content stated in our descriptions. 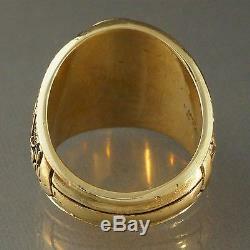 We will specify if an item is not solid gold. Express service available at additional cost. Actual rates are based on the final cost of the item. We do not mark merchandise values below value or mark items as "gifts" - US and International government regulations prohibit such behavior. Don't be skeptical of our no reserve auctions. Occasionally we set modest reserves that are based in reality. We know you will love our items and our service. If you are not satisfied for any reason, please let us know so that we may work with you to make you happy. 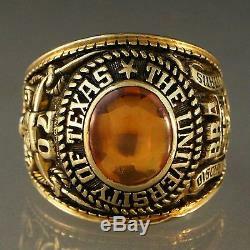 The item "Massive Vintage 1970 Solid Gold & Citrine, University of Texas, Men's Class Ring" is in sale since Friday, January 08, 2016. 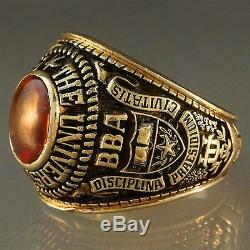 This item is in the category "Collectibles\Historical Memorabilia\Teaching & Education\Colleges & Universities". 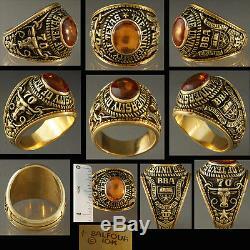 The seller is "oldetown" and is located in Santa Rosa, California.